Hello readers. Happy New Year! Hope you’re well. 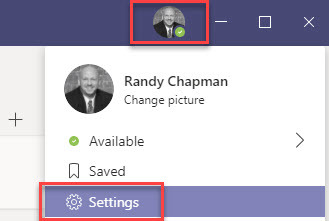 I noticed today that Outlook wasn’t displaying presence for some people when it usually does. I checked the Skype for Business client (you know, not Teams, the other one 😉 ) and I could see presence. So I found someone in Outlook that showed their presence and I moved the mouse cursor over their name to get the calling card popup. Then I clicked the speech bubble to start an IM. Curiously, it opened Microsoft Teams instead of starting a new Skype for Business chat. So I went one further and opened the contact card and expanded the ellipses menu to start a call. And again, the Microsoft Teams application opened and started a call to the number. The call failed in my case since I don’t have the Phone System license currently. 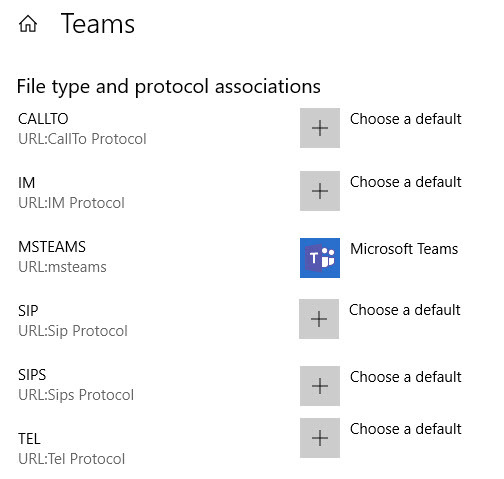 I didn’t remember changing any associations for IM or Tel or Callto protocols, but thought I would check. 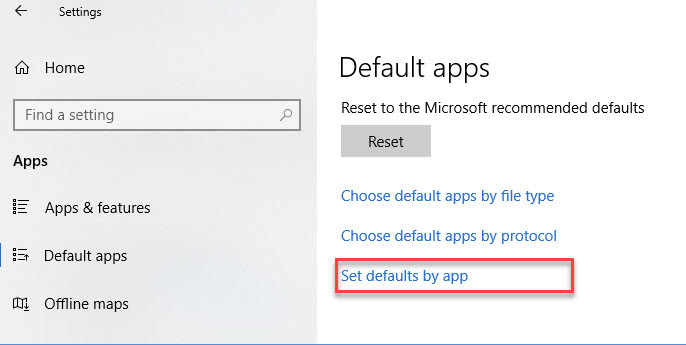 System settings -> Apps -> Default Apps – scroll down to the bottom. This opens the File type and protocol associations for Teams. Mine was largely set to choose a default. I changed IM to Skype for Business and I closed and reopened Outlook. Tested again and IM still opened Teams. I repeated with Callto and TEL and the same happened. I remembered seeing a tick box in the Microsoft Teams client. Open Teams and click your photo and settings. 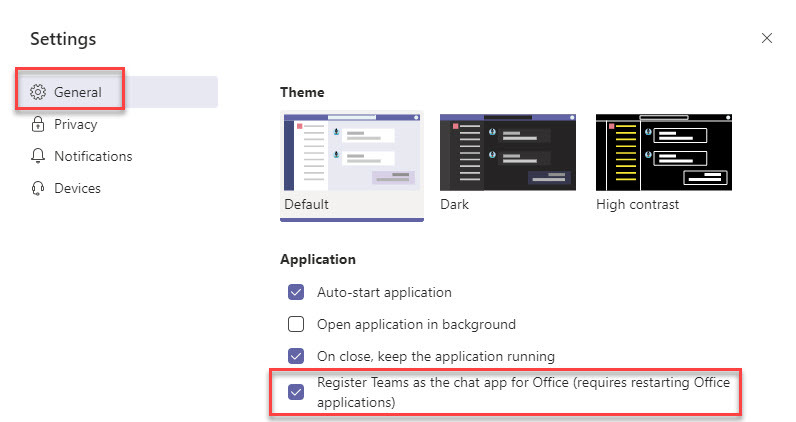 Under General, there is a tick box for Register Teams as chat app for Office. And it was ticked. I didn’t remember ticking this. 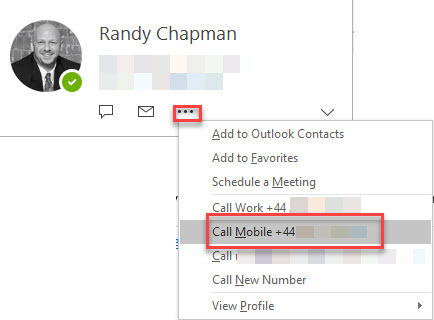 I still use Skype for Business as the default for IM and calling and I use Teams for collaboration and some meetings and calling. At least for now. I un-ticked this and restarted Outlook and tested. And low and behold, I was back to using Skype for Business for chat and calling. A few things to think about here. Somehow, this got ticked by itself. I didn’t do it. Although it says default app for chat, it also means presence and calling. It seems I’m not alone. I posted the question on Twitter and got a reply straight away that ‘loads of users reported that this got automatically ticked’ and ‘that none of the users were TeamsOnly’. I do mind that this got ticked by default, but I can live with that. I would love for the controls to be more granular. For instance, tick boxes for default app for chat, calling and presence in Office. I would also like to know how this one tick box controls the app behavior. I also looked in the registry, by the way, and none were set to Teams. If you want to know how, check this post by @shawnharry. Would love to know if you have any thoughts and comments. If this or any other post has been useful to you please take a moment to share. Comments are welcome. Next Next post: The first post on my new blog!